On Thursday, my colleague Brett went on record predicting that the Washington Nationals will hoist the Commissioner’s Trophy at the end of the 2017 season. 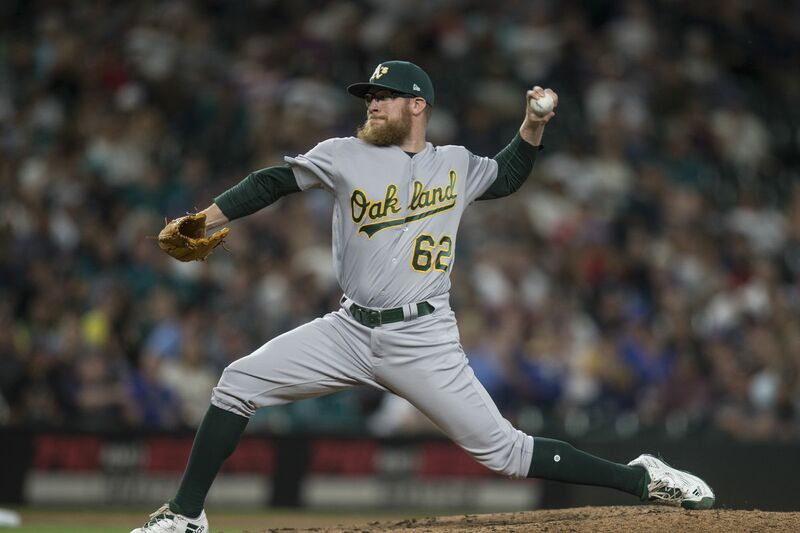 The NL East leaders took a step in that direction Sunday, acquiring relievers Sean Doolittle (LHP) and Ryan Madson (RHP) from the Oakland Athletics in exchange for RHP Blake Treinen and two prospects, LHP Jesus Luzardo and 3B Sheldon Neuse. The Nationals desperately needed bullpen help, if only to take some of the load off their stellar starting pitching. Their bullpen stands dead last in the majors in both ERA (5.31) and innings pitched (254.1). The offense and starting pitching have picked up the team, but success in the postseason relies on excellent late-game pitching, particularly from fresh arms in the ‘pen. General Manager Mike Rizzo knew that if his team wanted to avoid another embarrassing one-and-done, he needed to go out and buy some new arms. In Madson and Doolittle, Rizzo may have hit pay-dirt. Ryan Madson is a twelve-year veteran with experience on a number of playoff teams from the mid-2000s Phillies to the 2015 Kansas City Royals. He sports a 3.40 career ERA, and has compiled 11 WAR (per Fangraphs). The Nats are buying high on Madson, who is putting together one of his best seasons to-date. His K% is at its highest point since Madson’s 2010 season with the Phillies, and he’s walking marginally fewer batters. Madson isn’t a big strikeout guy, but he induces a lot of groundballs (55.8% on the season). In 2017 he has arguably been one of the top-30 relievers in baseball. The southpaw Sean Doolittle has been marginally less effective than Madson, compiling a 3.38 ERA in 21.1 IP (almost 20 fewer innings than Madson). Doolittle has been hurt by his defense though; his 2.35 FIP suggests he may be a candidate for positive regression with a change of scenery and a new defense. Unlike Madson, Doolittle gives up more fly balls (51.1%), but his move from the Coliseum to Nationals Park should help ensure that fewer balls clear the fence. Statistically, there’s a lot to like about both Madson and Doolittle. Both have been fairly effective pitchers for the Athletics, and with a more powerful offense spotting them leads they should continue to pitch well in Washington. The fact that the Nationals get a right-hander and a left-hander in the deal bodes well for Dusty Baker and gives more versatility to play pitcher-batter matchups late in the game. There’s almost little point in looking at what the Nationals are giving up in the trade. They’re in complete win-now mode, with Bryce Harper looking for all the world like he’ll at least test free agency in 2018. Luzardo and Neuse, the two prospects going to Oakland, won’t be ready for the big leagues for at least a few seasons, if they ever make it to the show. The Nationals also get rid of Blake Treinen, who has put together a disappointing first half. The Nationals needed more quality arms in the ‘pen; this deal added those arms without breaking the farm system. The only detractor to this deal is the financial hit for the Nationals. Madson becomes the most expensive reliever in the bullpen, as the Nationals are picking up the last year and a half of his 3-year/$22 million deal from Oakland. Madson is 36 now, so it’s fair to wonder how effective he’ll be in the last year of his current contract. Doolittle is a bit more manageable. He’s due $2.6 million this season, then $4.35 million in 2018 with $6 million club options for 2019 and 2020. For the value they provide Madson and Doolittle are being overpaid, but not egregiously so. There’s a lot to like in this deal for Nationals fans. They improve their woeful bullpen at little cost by adding two effective arms. It’s a safe move by Mike Rizzo, but it’s not enough. If the Nationals truly want to contend for the World Series, they need to pick up one more quality arm to work out of the ‘pen. Madson and Doolittle are great pieces, but the Nationals still lack that one bullpen arm they can turn to in high-leverage situations. Find that piece, and the Nationals go from World Series hopefuls to serious contenders for baseball’s biggest prize. Next Post: Are the Indians in Trouble?